I was 16 when I first discovered Buffy. My friend Stacey had a poster of Angel on her bedroom wall and as soon as I saw it, I knew I had to watch. I was already a season and a half behind, so she lent me her VHS tapes so I could catch up. I spent hours of my weekends in my lounge transfixed to the screen with the curtains closed, watching this powerful girl defeating demons and the angst that comes with being a teen. Then I had to find a design and a place to put it. I knew I wanted to be able to hide it, so I chose my lower left back (where it could be seen if I was wearing a crop top). I also knew I wanted something from Buffy, but wasn’t sure what. 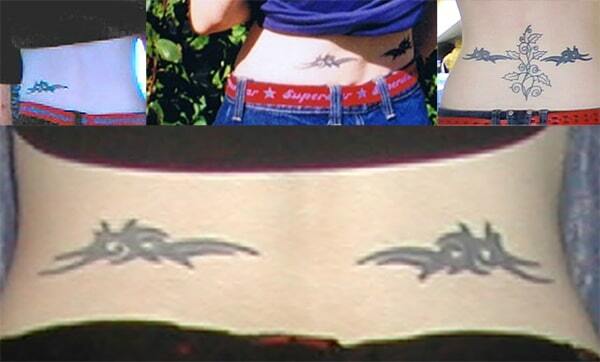 The choices were; a B in the Buffy font, the Angel wings from the boxsets, the mark of Eyghon or Faith’s tattoo. I ended up choosing Faith’s one. It’s supposedly the mark of Kakistos; an ancient vampire master and is a mark of servitude to him. The mark allows Kakistos to track those branded with his mark. He shows up in the season 3 episode “Faith, Hope and Trick” and is killed by Faith. It was so painful, but mostly from being man-handled and squashed down on to a chair. When it was finished, I stood up and nearly fainted as all the blood suddenly rushed to my legs!! I wasn’t given much aftercare advice so it scabbed really badly. 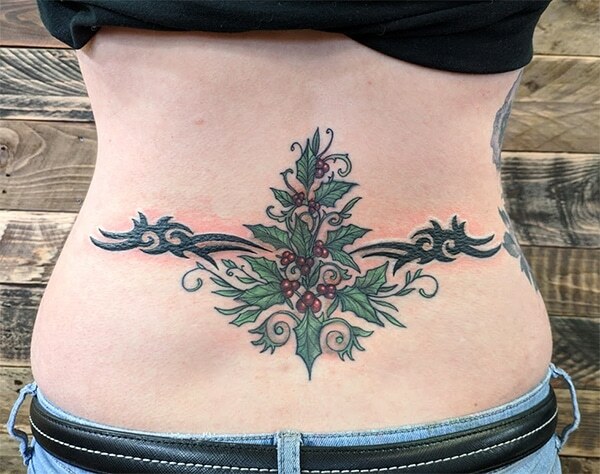 A few months later, I decided that one tattoo on my left side looked a bit stupid, so I went to another tattooist to get the mirror image tattooed on my right side. Unfortunately, I didn’t take the same design from the first tattoo, and just printed another pic off the internet! The tattoo studio didn’t bother to check whether they were the same, so I ended up with tattoos of slightly different sizes. These are the best photos I have from around the time they were first done!! As you can see below, the left one is definitely worse. Over the years, it’s shrunk and the lines have blurred a lot. The one on the right is a little better in terms of the outline, but the outline and the colour don’t match! Lou said she could fix them up for me and refresh them, so for the third time, I put my complete trust in her. These tattoos were incredibly painful, especially the left one as it had scarred quite badly (the original tattooist had gone in too deep with the needles!!) Lou wasn’t able to numb them, she did try but the skin wasn’t open enough 🙁 Luckily they only took about 30 minute each! Lou re-did the lines and added some white/flesh coloured ink to hide some of the old tattoo lines. She then filled them in with fresh colour. The photo below was taken about 5 minutes after she’d finished tattooing. You can see the white around the edges and some of the flesh colour (which will fade in time). I absolutely love them!! This is what they should have looked like the first time around!! She got them as close in size as possible, although the one on the left will always be a bit smaller. Like Nemo’s fin. I’m so happy with them now, Lou is an angel!! I love this so much! It looks fantastic all together! I was eagerly awaiting your update to this and Lou seems like a great artist! These look so fresh and well coloured. Really made me notice how much mine needs reworking. I love them all together! I’ll happily admit I squeed a little when I saw Faith pop up in my feed reader. 😂 Then a little more when I saw the post title, lol! 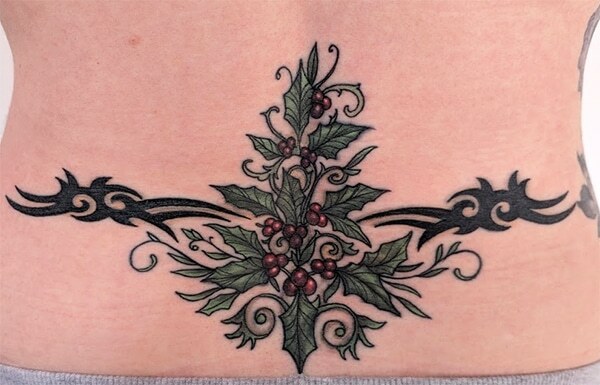 I love how Lou was able to fix them up for you and give them a ‘new lease of life’, they go well with the new holly tattoo. I have Faith’s tattoo covering my lower back but it could do with freshing up as it’s quite faded. It’s my first and only tattoo but I do want the Stargate symbol for home and a dinosaur design (to celebrate my love of Jurassic Park), at some point. I should just get and book it really! 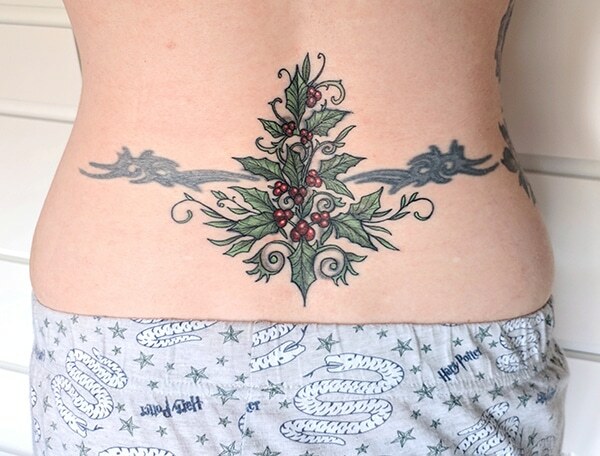 I’ll have to have a look for tattotists as it’s been years since I got it done, they changed hands. We may have, I can’t remember! I want the chevron symbol for Earth or the complete gate address for Earth. It would be random letters to most lol but recognisable to Stargate fans. Yeah you should 🙂 and the chevron symbol would be so cool!! They look soo good now!! She did an amazing job. I got my first tattoo when I was 14 and they did a horrendous job haha I should probably consider covering it up sometime! Thank you, she really did!! Oh no, lol … What did you get?